When gold was discovered in 1848, people poured into California to prospect the "golden mountains." greed. 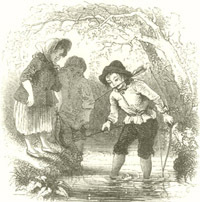 The impact of the gold rush, however, struck much deeper than soil of the Sierra Mountains. prosperous through other means other than mining. The gold rush created a major labor shortage as many Californians left their jobs and went to the gold fields. This shortage created opportunities for many people that needed the work. Most of these people were immigrants who, when they finally reached California, found that the gold was harder to find and less abundant than they dreamed. They consequently got jobs in the cities and towns that were quickly growing. Unfortunately, this labor shortage also resulted in the exploitation of the Native Indians that was quite similar to slavery, without the official name. 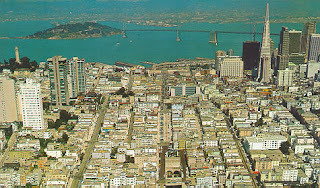 The huge influx of people into California, especially the city of San Francisco, opened up many more opportunities in the economic scheme of things. Manufacturing, trade, merchant businesses, agriculture, entertainment market, and the newly formed banks and financial institutions all flourished and prospered because of the gold rush. By 1855, the day of the individual miner was dead and the modern capitalistic economy was established. The economy in California blossomed. The national economy also was impacted by the gold rush and did well because many companies across the country invested, in some way, shape or form, in the gold rush. The table below shows the rapid increase and then the decrease of the amount of money that came out of the gold fields of California. However, what this table doesn't show is that as the dollar amount of gold produced decreased, the dollar amount of business and industry was steadily rising because of the new business that was initiated during the gold rush. Europeans, South Americans, Chinese, Mexicans, free blacks and slavesthat came with the southern migrants. As this heterogeneous population evolved conflicts over gold and jobs collided with issues of race and ethnicity(click here to read about the impact the gold rush had on the Native American population). California was a very turbulent place. There was pressure on the national government to create a more stable and effective government. The gold rush therefore, forced the national government to deal with the status of the territories. The United States saw the need to establish government in the territories like California. It also forced the nation to deal with the issue of slavery in those territories. Slavery was already a big issue on the East coast. The admission of California into the union would upset the balance of free versus slave states. This pressure added to the slave crises, which was temporarily defused with the Compromise of 1850. Unfortunately, the Compromise of 1850 would fail and the United States would find itself in a civil war. Although the whole state of California is known because of the gold rush (think of the state nickname, the "Golden State" and our NBA basketball team the "Golden State Warriors"), one of the most significant and important places of the gold rush was the city of San Francisco. Before the rush San Francisco was a small tired village, but after the gold was discovered it was soon one of the fastest growing cities in the world. In 1845, the population of the city was around 400 and by 1860, when the rush had slowed down considerably that number was over 56,000! San Francisco was the closest port to the gold fields, thus everything- miners, merchandise, supplies and gold- passed through the city. At the height of the rush the city was a crazy, exciting place, but only a few years earlier, when the rush first began, it was almost deserted because so many people left for the mines. Even the newspapers had to shut down. At first, the city was covered with canvas tents and flimsy wooden shacks. It was dirty and crowded. This posed a fire threat. 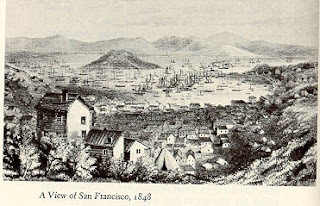 On May 3,1851, the first major fire in San Francisco's history burned down twenty two blocks in ten hours. But before the ashes even cooled buildings were being constructed. Gradually, the wooden houses were replaced by brick. 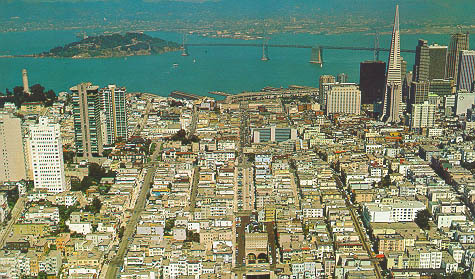 San Francisco was a boom town. It was very diverse in the race and ethnicity of the people that had come to California. These people brought with them their own culture and beliefs. This heterogeneous society created a lot of tension, but also helped shape the city as it evolved. As one walked down the street, they could witness every type of dress style in the world that had been seen in the last 25 years. Rarely was anyone considered bizarre or strange. The city was growing culturally, physically and economically. One of the great commercial city was evolving. Two images of San Francisco from similar viewpoints. The top is the city in 1848, the bottom in 1984. Notice the changes between the two.